ActivPanel allows complete control of the lesson, the lecture and ActivInspire software, without requiring you to turn your back on the audience. Anything visible on your computer screen is displayed on ActivPanel and everything on ActivPanel projects onto the screen size of your choice. 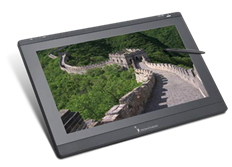 ActivPanel supports inclusion by enabling special needs students who are unable to easily reach or see the ActivBoard to interact with lesson content by writing, drawing or manipulating objects on the desktop screen in front of them with a highly accurate wireless pen. Students can fully participate with their classmates by adding notes or drawings to Flipcharts, dragging and dropping images and playing video or audio—all with the press of a button.